I love to fish,swim,catch lobster,shrimp,and 'noodle' in the canal. Islamorada is the fishing capital of the world. It's peaceful and quiet here. Walk to boat rentals. The seabreeze and resturants are superb. We swim and 'noodle' in the clear canal water. ISLAMORADA, LOTS OF SHOPPING, about 3 miles GROCERIES -PUBLIX -BAKERY, BEER WINE, FRESH PRODUCE. WALK TO BOAT RENTALS AND RESTURANTS. 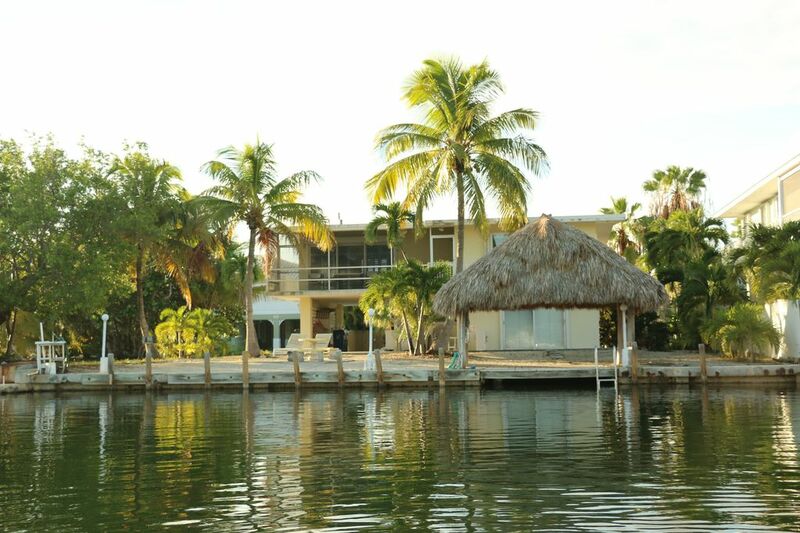 On a Private canal 100 feet wide, with a 70. foot private dock. 1000 feet from the Atlantic via Snake Creek. On a clear water canal 1000 feet from the Ocean. Luxury 800 thread count sheets on all beds. Embroidered ISLAND TIMES towels. All white towels and 3 beach towels for boating provided. Two full size kitchen refrigerators, one up stairs, one downstairs. Cuisinart pots and pans, dishes, wine glasses, silverware, plates, coffee maker, coffee cups, blender, toaster, and plenty more. Full kitchen upstairs. Downstairs kitchen too. several additional matching chairs available. 2 flatscreen TV's with Comcast Cable basic provided. Other TV's provided in each bedroom. CD Players up and downstairs. Tropical Music provided with including local musicians and many more! Many movies to watch from in Island Times video library. Bring your own for your 70 foot dock or other boats are available for rent, nearby. Detailed map for launching available by request. Wood deck with shady thatched Chickee on the water. Being at Venetian Shores was the best place to achieve our vacation plans which were fishing, fishing and fishing. We rented a boat and having a deck in the canal was ideal. The house was clean and very practical for ou group of 6. Thank you so much for the Happy times you describe, because productive fishing is one of the things that make our location ideal. No matter if you fish off shore, reefs, the Gulf, people of all ages, love it. Hope you enjoyed some of the waterfront restaurants too. They will cook your catch. We recently rented this house for corporate lodging purposes. It was a wonderful place to stay and was in a great location. The owner was incredibly easy to work with and very accommodating. We highly recommend this property. I’m delighted that you enjoyed the location. Thank you too for being a pleasure to work with. It was a joy to see all your staff leave the house ‘Ship Shape’ as they found it. This home compared in price to a resort but gave us so much more room and freedom. The dock was a perfect place to fish casually from. We found everything we needed to cook our own meals when we wanted. Free admission to Founders Park gave our young adults plenty to do. Wave running, deep sea fishing, biking, the beach and a splash pad for the toddler. We love Islamorada! Thanks, Leslie, for the nice information. We always like to hear great comments . It gives us input on how else we can make your stay better. So glad you enjoyed all the amenities of Islamorada too.! Island Times worked great for us. Good dockage for the boat, and quick access to both the Atlantic and Gulf. Bait freezer, water hoses, power, etc. House was great as well. Two separate units but that worked out fine. Close restaurants. Look forward to coming back. So glad you had a great time. Enjoyed your note at the house too. Thanks for leaving the house as clean as you found it. It’s nice to have quality guests. Thanks for the nice review. We love getting notes at the house too. It was a delight to meet you, Sally, Wendy and Gary. We love that you left our house as clean as you found it. We have since replaced a fish I. D. chart just in case we're not around. It'll be great to see you all as a repeat clients for years to come. Perhaps we will get to meet your grandchildren too. Please check the calander for your dates as our repeat clients book early.